Macrophage. 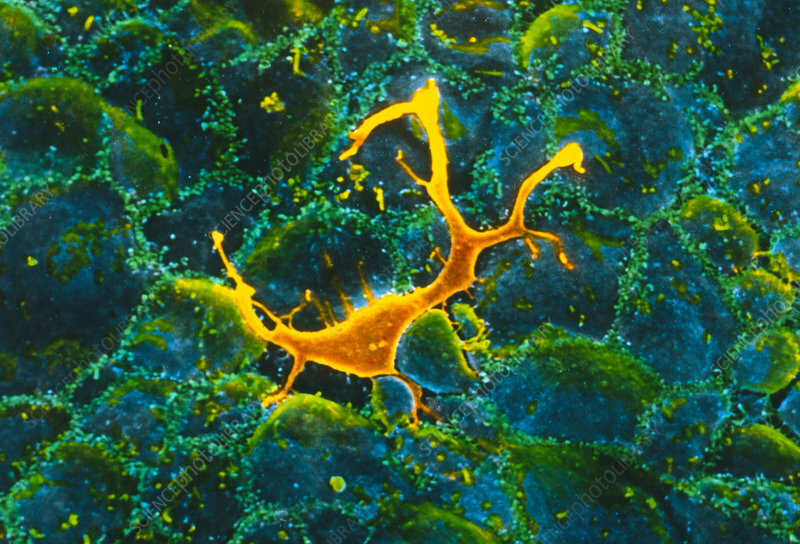 False-colour scanning electron micrograph (SEM) of a migrating macrophage (yellow), found on a layer of epithelial cells. Macrophages form part of the reticulo-endothelial system, also known as mononuclear phagocyte system, which includes all those cells and tissues with well-marked phagocytic properties. Macrophages are capable of engulfing and digesting cellular debris, bacteria, foreign bodies and aged red cells. Their shape is irregular and characterised by thin projections (filopodia) which are used by the macrophages as a support. Magnification: x870 at 6x7cm size.